Mutton Roce Curry (with coconut milk) | My Cooking Diaries "CooklikeCecilia.com"
Clean, remove skin and cut mutton into medium pieces. Wash and set aside to drain. Add the light coconut milk & bring to a boil. Reduce heat and simmer until the mutton is tender. Add the ground masala paste, water for curry as required and when it starts boiling, reduce heat and simmer for 5 minutes. Then add the potatoes and when the potatoes are cooked, add the thick coconut milk, stir well and simmer for 5 minutes. 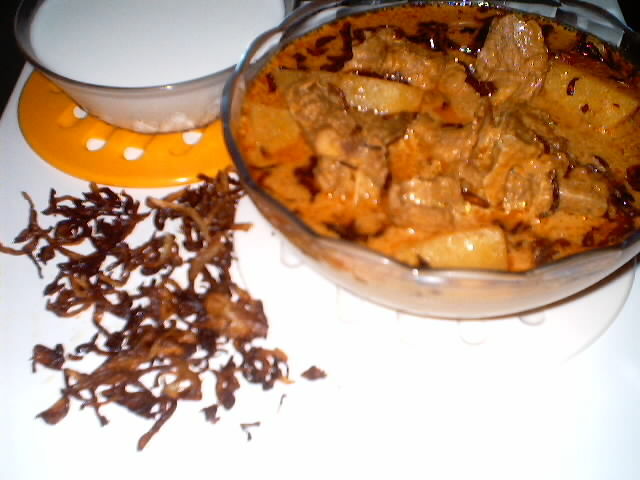 For extra flavour, garnish the mutton curry with one sliced onion fried to a golden brown in 2 tbsp. oil.